These 12 gauge shotshells fire a 1 1/4 ounce load of #6 shot at 1,330 feet per second, a relatively high velocity that gives you some extra power and reach for downing birds and other small game at relatively long range. 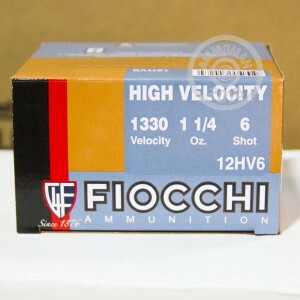 This ammo comes in boxes of 25 from Fiocchi's US production facility in Ozark, Missouri. 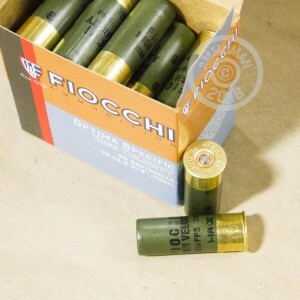 Fiocchi is one of the top shotshell manufacturers in the world and delivers an excellent product at a reasonable price point. 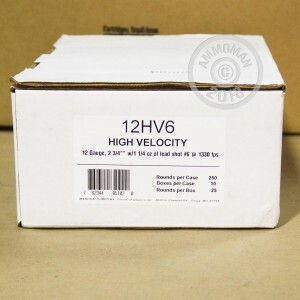 Remember that AmmoMan.com offers free shipping on all orders over $99. Place yours today and enjoy double digit savings on quality ammo. Five Stars all around on all aspects of the transaction and the item !